Think of the Bard Prison Initiative (BPI) as a college unto itself. It enrolls over 300 students in challenging academic programs, maintains a robust alumni network, and organizes a national replication and advocacy consortium. It charges no tuition and has no endowment. In other words, BPI’s work — and so many of our students’ achievements — are possible only because of the loyalty of friends like you. Your donation will help BPI continue the groundbreaking work to redefine college access in America and to address the negative impacts of mass incarceration. Become a BPI supporter today and join a distinguished and passionate community that still believes in the transformative power of a genuine education. BPI has deep and longstanding relationships with our funders. They make it possible for us to carry out our mission. We honor supporters by serving as good shepherds of every dollar raised. We are proud that nearly 50% of BPI’s budget supports rigorous academic programming for BPI’s core, the College. The remainder covers the cost of BPI’s offices of Reentry & Alumni Affairs, National Projects and the Consortium for the Liberal Arts in Prison, as well as BPI’s newest program, the Bard Microcollege. Because of the generosity of Bard College, every dollar raised by BPI directly supports programs. Gifts to BPI are tax deductible to the fullest extent of the law—Bard College is a 501(c)(3) organization. All gifts and donations made to the Bard Prison Initiative are used exclusively by BPI. 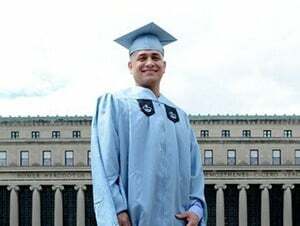 Your generous support helps students reach their full potential, like BPI Alumnus Rich Gamarra, who recently earned a Masters in Public Health degree from the Mailman School of Public Health at Columbia University. A community leader, Rich now oversees a project at the New York City Department of Health and Mental Hygiene that supports formerly incarcerated individuals. Making a charitable contribution to BPI is easy. Gifts can be made via check, credit card, wire transfer, stocks, or real estate. As a program of Bard College, a registered 501(c)(3) non-profit organization, gifts are tax-deductible to the fullest extent of the law. Please check with your financial advisor for specific information regarding the deductibility of your gift. Bard College accepts VISA, MasterCard, American Express, and Discover Card. To make a contribution by credit card over the telephone, please contact Laura Liebman at 845-758-7332, or donate online. BPI welcomes donations via wire transfer. To make a gift via wire transfer, instruct your brokerage or bank to arrange for the transfer of funds electronically to the Bard Prison Initiative account at JP Morgan Chase. You must email, fax to 845-758-4294 or mail a copy of the instructions you send to your broker or bank officer, along with any special instructions regarding the purpose of the gift. Thank you for your gift to Bard! If you wish to speak to someone regarding your gift, please call the Gift Recorder at 845-758-7861 or giftrecorder@bard.edu. When you donate appreciated stocks to BPI, you avoid the capital gains tax you would have paid if you sold the asset for a profit. If you have owned the securities for longer than twelve months, you also receive an income tax charitable deduction for their full fair-market value. These tax savings–both in income and capital gains taxes–make gifts of securities a popular alternative to cash. If you wish to maintain a particular stock in your portfolio, consider giving BPI the stock and using the cash you would have donated to purchase the same securities in the open market. The newly acquired shares will then carry the current market value as their cost basis, an easy way to reduce future capital gains tax liability. To make a gift of stock please instruct your broker or bank officer to arrange for the transfer of securities electronically to BPI’s account at UBS Financial Services, Inc.
What is a donor advised fund? A donor advised fund (DAF) is a type of giving program that allows you to combine the most favorable tax benefits with the flexibility to support your favorite charities easily. DAFs are an excellent way to simplify your charitable giving and facilitate your philanthropic goals. The John Bard Society was established to recognize loyal alumni/ae, faculty, staff, and friends who have made provisions for Bard College—planned gifts—in their estate plans. Some include a bequest to Bard in their will, some contribute to Bard’s pooled income fund, and some establish a Charitable Gift Annuity with the College. Planned gifts have far-reaching effects that benefit today’s Bard students as well as those of tomorrow.